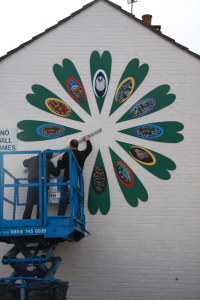 As part of Craigavon Borough Council’s delivery of the Re-Imaging Communities Programme I was commissioned to produce an artwork to be sited on the gable end of this community house as young and pre-school children regularly use the area as a safe place to play. It was important for the residents that the artwork was colourful, visually attractive and also acts as a learning and play aid for children. Before housing was built on the Garvaghy Road the fields where filled with roses as they belonged to the world famous rose growing firm, Sam McGready & Sons. When completing initial research with the community it was strongly felt that this history be reflected in the artworks design or content. Workshops where held with local children to record and develop themes they felt best represented ‘their space’. A newsletter was distributed to all the houses in the area with details of the artwork. The feedback was extremely positive, as many felt it ‘belonged’ or took into consideration so much of what was important to the youngest generations. The choice of materials was informed by the commissioner’s requirements to have a permanent piece of artwork that enhanced and was relevant to the environment in which it was sited. The artwork consists of twelve elongated heart shapes with a circular shape at its centre. They are constructed from 6mm steel plate, which has been laser cut and powder-coated using a variety of colours. On each piece is a glass mosaic, which narrates a different story drawn from community workshops. The glass is vitreous so suitable for exterior environments and the mosaics have been attached to the steel using adhesive suitable for bonding these materials, exterior applications and longevity. The artwork is approximately 3400mm in diameter and only 16mm deep. It has been installed on the gable wall of a house, approximately 2500mm above ground level. This work consists of four suspended glass panels, each measuring 6m long by 1m wide. A sandblasted map of Derry stretches across them with the River Foyle highlighted in blue. Onto the glass 40 ceramic domes have been placed to be visible from the outside with a further 40 on their reverse visible to the interior of the building. The stoneware domes have been decorated with under glaze colours, enamels, printed decals and lustre’s. The exterior domes are marked with a year number from the Credit Unions ‘birth’ in 1962 to the present and make subtle reference in their design to wallpaper patterns popular in each particular decade. The interior domes, which are more closely visible from the inside of the building, depict a variety of images and narratives commemorating the history, important events, and people who have been instrumental in forming the Credit Union and its impact on the community it serves. To gain a more concise insight, I held workshops with the Credit Union’s youth committee and children in local primary schools, interviewed Credit Union staff and carried out extensive research into the Credit Union’s own archive materials. I was commissioned to work with Year 7 primary school children on designing and making an artwork for their school that celebrates and encourages reading. 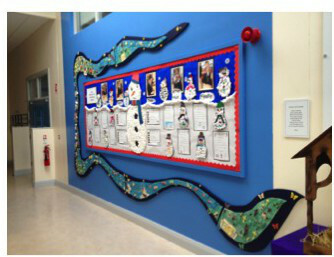 The piece is comprised of over thirty ceramic and mixed media ‘bookends’, which have been mounted in the school’s reception area. Each child made a ‘bookend’, which they felt depicts or represents their favourite book. The group also designed the figures that are sitting, standing or lying across the books, enjoying their reading time. I was commissioned to work with year 5, 6 and 7 primary school children, to design a visual narrative depicting the story of Saint Colmcille. This design was then made in clay, with each class allocated specific sections to make. The mural stretches over six metres in length and rises to five metres in height. The children also made small storybooks, which were attached to the boats symbolising the transfer of knowledge between peoples. The three large steel sculptures are shaped into giant leaf shapes from lots of single hand shapes & coloured blue, brown and silver. They represent different stages in the history and development of the area. In each hand ‘a lucks penny’ is placed as a symbol of good will and community spirit, these pennies mark the names and dates of birth of all the participants in the project along with visual images which symbolise the lives of some of the older residents. This work is sited in the children's section of Central Library, Ballymena. Each house depicts a collection of children stories or nursery rhymes. The houses are made of clay with elements of textiles and found objects included.. The library ran a poetry competition with local schoolchildren and the winners poem is depicted in the centre house. I was commissioned to produce two large scale ceramic murals for the Causeway Hospital, Coleraine.